Hello! This is a scheduled post. 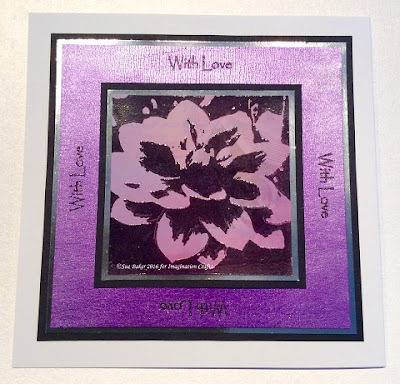 I'm at the CHSI trade show, with Imagination Crafts & Lisa B.
I was thrilled to receive a set of the brand new Starlights paints from Imagination last week, so I immediately made a few quick & easy cards to see what I thought of the colours. following our One Day Special). 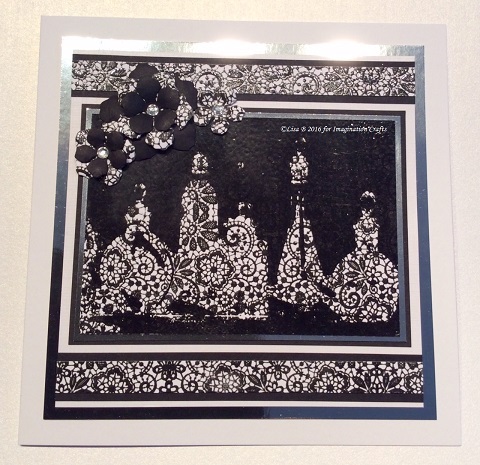 This card has the new Pearl Starlight applied through the Flint Texture stencil on to black card. Lots of people asked us for a white Starlight & this is it. 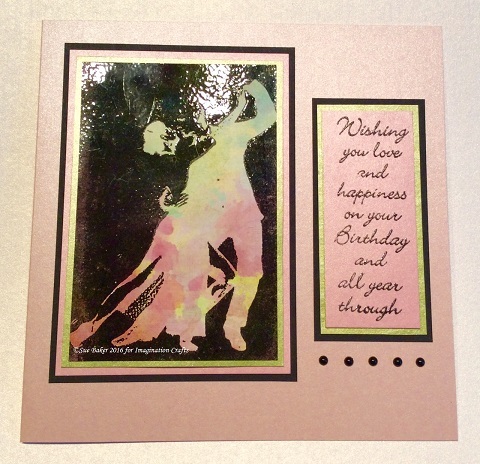 Not only does it look great on dark card, it can be mixed with all the other colours, to give lots of different shades. 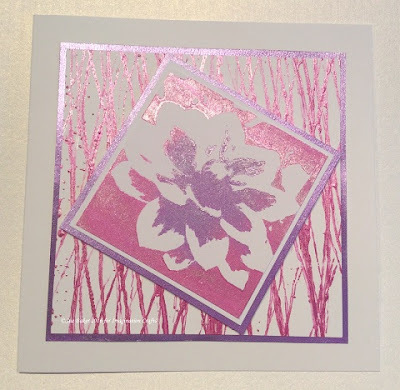 For the second card, I painted white card with Pebble Shore MDF paint & applied Amethyst Starlight through the Summer Blossom stencil, with dots of the paint applied with an embossing tool. 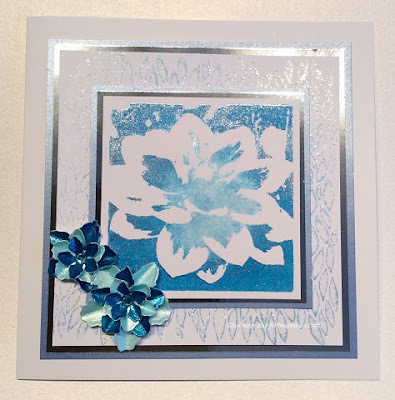 I used the same, Summer Blossom, stencil for my third card, using Sax Blue Starlights, then I added foiling with Pastel Yellow Sparkle Medium. 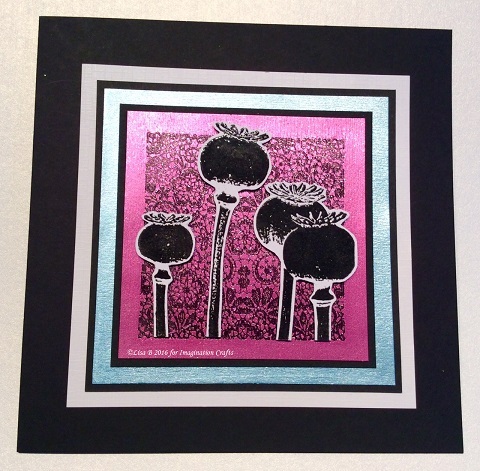 (The greeting on these cards is a Stampendous stamp from my craft stash). All seven of these new colours are, without exception, gorgeous & I loved working with them. 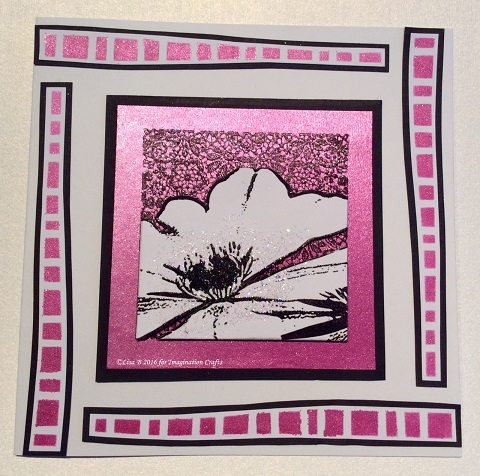 I will be back with more of my cards soon. That's it for today, I will be back soon. Keep an eye on our Facebook page for updates from the trade show. Well, you did it again. 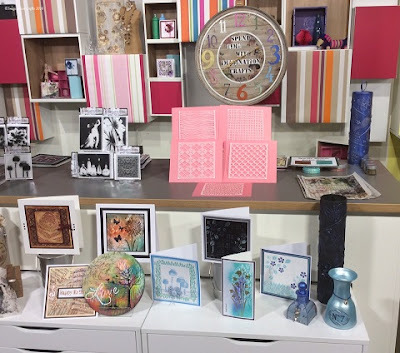 You made our second One Day Special on Hochanda a rip-roaring success & the feedback we're receiving is overwhelmingly positive, so thank you very much. Thanks also to Sue & Lisa, who demoed a lot of their cards on the shows. I'm going to try to get them to do a few blog posts of their projects for you in the next few weeks. Many of the samples will be with us at the trade show at the NEC this weekend, so the retailers will get to see them up close. We'll also bring some with us to the retail shows we'll be attending this year. 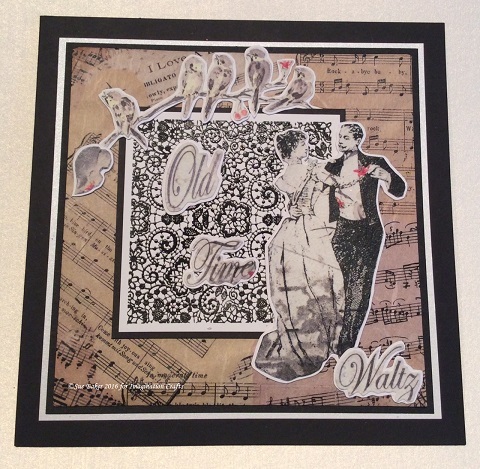 Putting on the Ritz sets remaining on the Hochanda website & again, we will let you know when we have the individual stamps for sale. 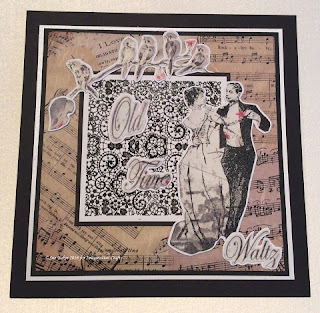 You can find all the remaining items on the Hochanda website. Thank you very much to everyone who bought our products from Hochanda yesterday, we really do appreciate it. We know that our products are new to many of you, so if you're unsure about using them, please don't hesitate to contact us, either via email; imaginationcrafts@btinternet.com, or message our Facebook page. We will reply as soon as we can. 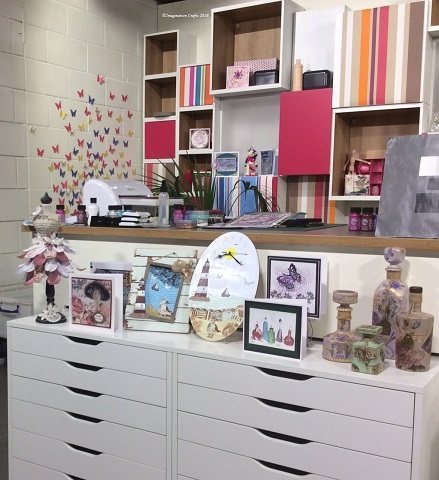 Thanks must also go to the team at Hochanda, who work so hard to ensure things run smoothly & to Hayley, Leonie & Charlie, I know how much Sue & Lisa love working with you. Imagination Crafts will be back on Hochanda, next Saturday, February 27. Times tbc. We will spend today making the final preparations for the trade show, setting off bright & early tomorrow morning for the NEC. I will try to post photos of our stand on the Facebook page. Have a great weekend & thank you again. Good evening blog visitors, happy Wednesday evening. 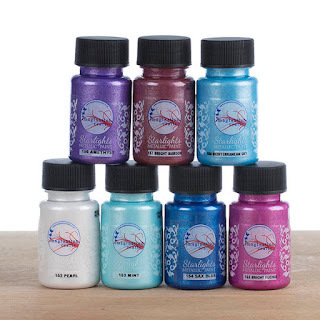 Imagination Crafts is LIVE right now on Hochanda & we are thrilled to announce that our ONE DAY SPECIAL is SEVEN brand new colours of Starlights Metallic Paints!!! The One Day Special price is £21.99, that's a saving of £6.00! 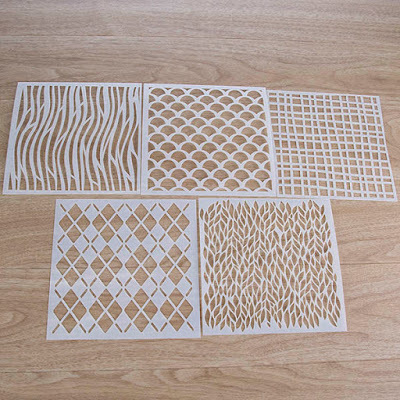 The product code is 401241. And one of the new colours is WHITE...............!! 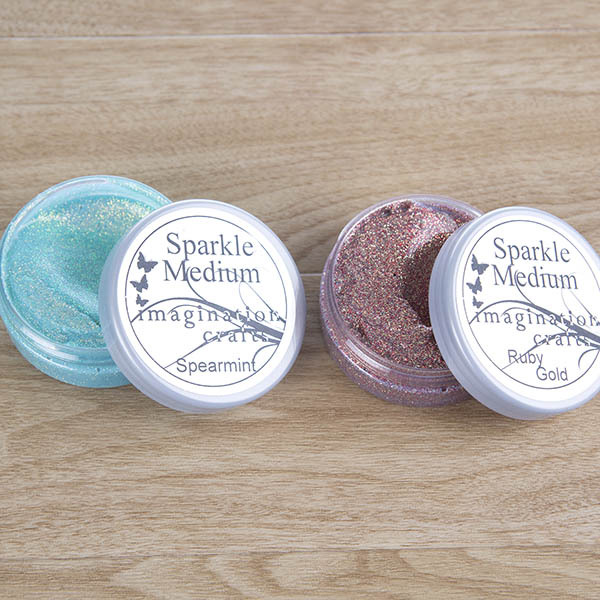 Every one of these colours is going to be a must-have addition to your crafting stash. 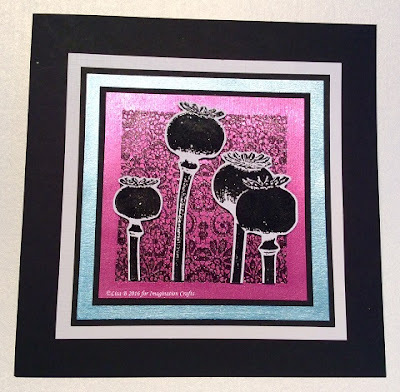 To give you an idea of how the colours look on black & white cardstock, I applied each colour through the Two Leaf stencil. The One Day Special price is almost equivalent to TWO pots FREE. Knowing how popular these beautiful paints are, we got in as much stock as we could, but there may not be enough to go round, so please get your order in as soon as possible. 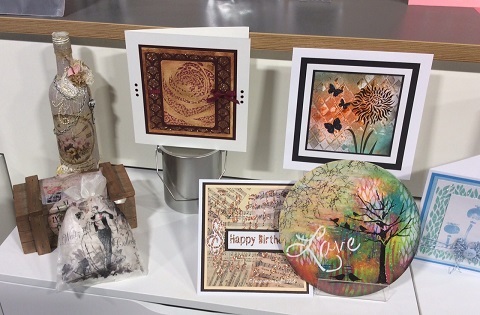 We have four more shows on Hochanda tomorrow - at 9am, 12, 4 & 7pm - but once this One Day Special is sold out, it won't be repeated. & I will have more projects to show you in the coming weeks. 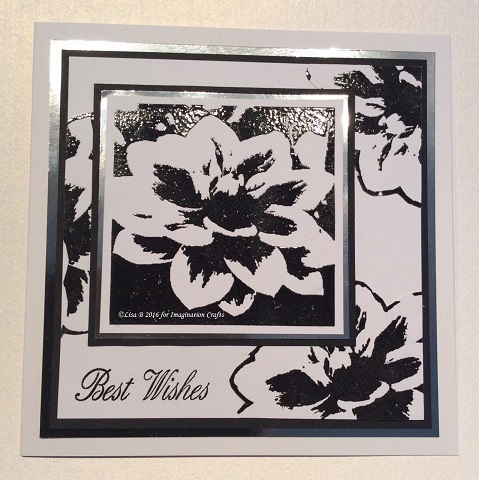 Enjoy the Hochanda shows tomorrow & thank you for your continued support. 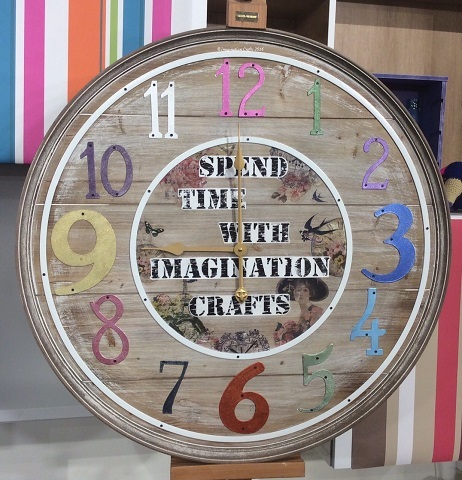 Imagination Crafts' One Day Special Tonight!! Seven brand new Starlights Metallic Paints!!!!!!!!!!!!!!! These colours are absolutely gorgeous & as you can see, they include a WHITE Starlight! It's a beautiful pearl white, which not only looks great on dark card, but you can mix it with any of the other colours to create different shades. The One Day Special price is not to be missed & will likely be extremely popular, so make sure to order yours during tonight's 8pm launch show. 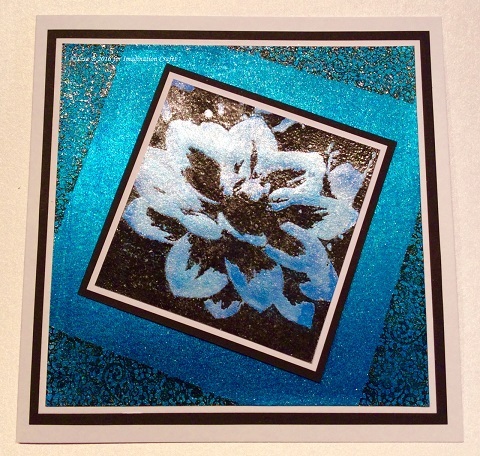 There will be lots of other new products, which you will find on the Hochanda website from tonight. Sue & Lisa B will have lots of fantastic demos & you'll see the products used to make these cards & those in our previous two blog posts; yesterday's is HERE & Monday's is HERE. Tonight we begin the release of some of our BRAND NEW products for 2016 & we're thrilled to be launching some of those products on Hochanda, starting tonight at 8pm & continuing tomorrow, Thursday, February 18 - programme times are 9am, 12pm, 4pm & 7pm GMT. 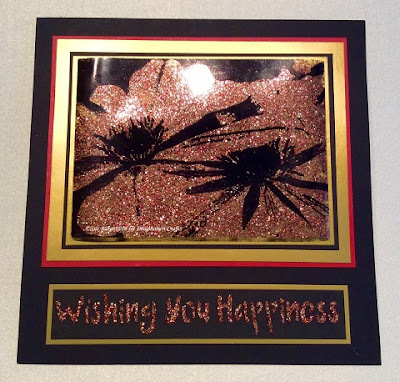 As well as new products, we'll have some old favourites too, along with gorgeous samples from all our designers & of course, fantastic demos from Sue & Lisa B.
February Newsletter - Brand New Starlights!!! 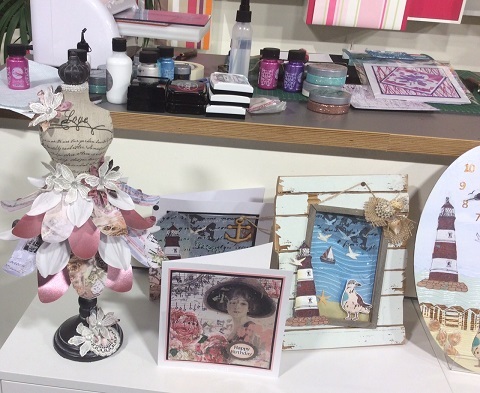 We are back on Hochanda tomorrow with a new One Day Special & this has to be the show everyone has been waiting for. We are launching the BRAND NEW set of STARLIGHT COLOURS tomorrow evening, 17 February, at 8pm, at an incredible price. One of the new colours is PEARL. Lots of you asked us for a white Starlights & we are thrilled to finally have one. One of the great things about this colour is that you can mix it with any of the other colours to make different shades - and it's gorgeous on its own too. It’s a must-have! 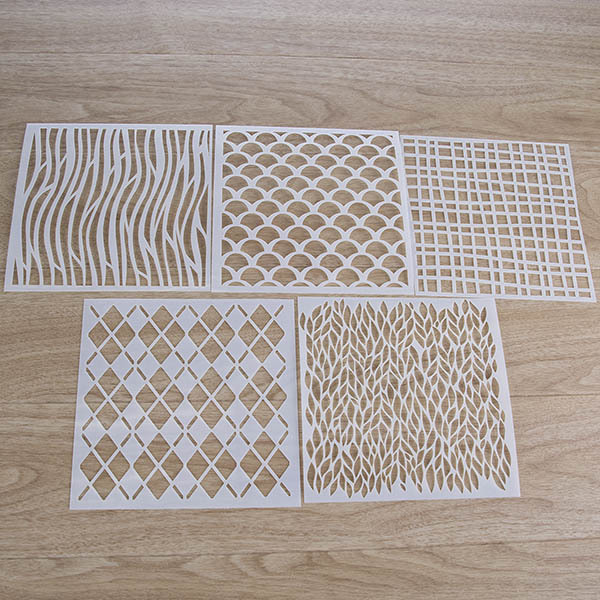 The Hochanda price means that you will save around £6.00 on the set. You can’t afford to miss out on this amazing offer!! Please get your order in quickly, as we know this will be a very popular offer and we would hate you to be disappointed. 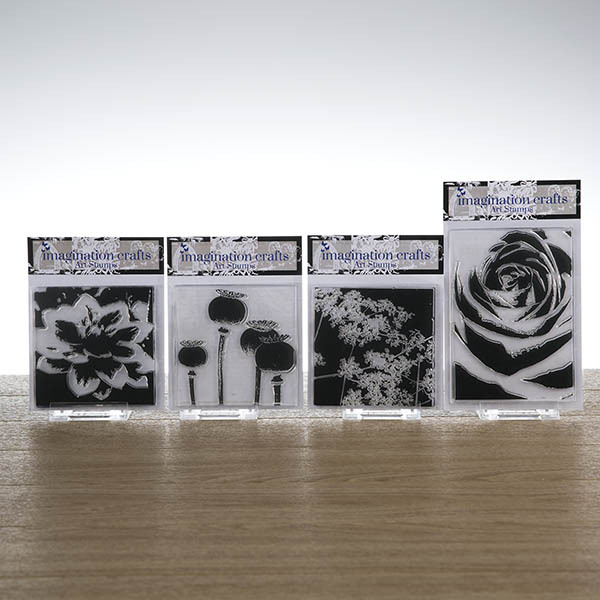 We are also launching 2 new sets of the brand new Art Stamps. 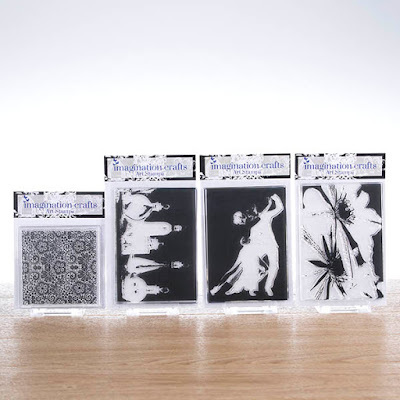 These are very unusual stamps and not like anything else on the market. If you want class and creativity all wrapped up in one, these are the stamps for you. As ever they are created by our own artists and if you love botanicals, perfume, lace, wild flowers and stunning imagery watch out for demos that will inspire you. We have some new Rice Paper sets for you and we know how much you are loving the Rice Paper. It is such a versatile product and so easy to use on cards and for mixed media with our Decoupage Glue. There will be lots of other products too, so visit the Hochanda website for full details tomorrow. Lisa and I have spent the last 10 days locked away in our studios, preparing demos that we hope you will love. We put everything we have into every card and every demo so that you will feel inspired and enjoy what we have in store for you. We know from your emails how frustrated you get when you miss out on the offers, so please get your orders in early and if you have any problems email us, or message our Facebook page and we will always do our best to help in any way we can. 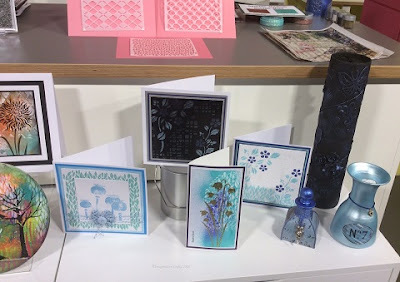 As soon as the last Hochanda show finishes on Thursday, we are straight off to the NEC to prepare for the Trade Show and then we are back on Hochanda on Saturday, February 27, so please bear with us if we have a bit of a delay answering your messages, we will get back to you as soon as we can. See you tomorrow at 8pm, stay warm and cosy in this freezing weather. Love from all of us at Imagination. Good morning, Kirsten here with cards made by Sue for tomorrow's Hochanda shows. 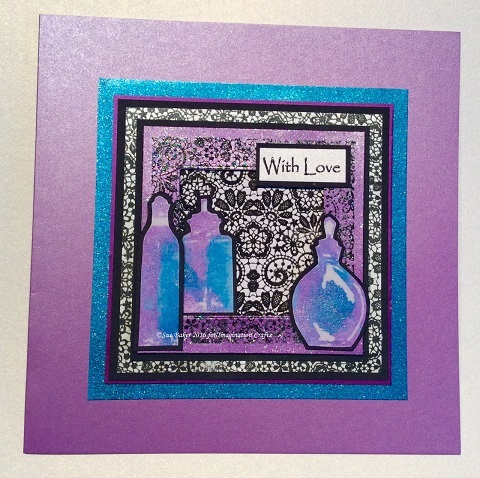 We'll share more of Sue's cards on our Facebook page later today & here on the blog tomorrow. 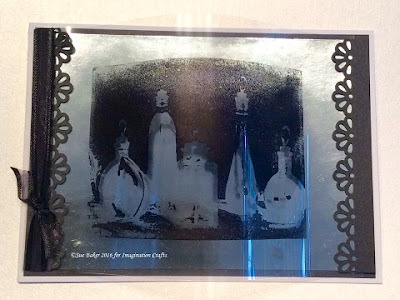 Imagination Crafts returns to Hochanda tomorrow night with an extra special ‪ONE DAY SPECIAL‬!!! 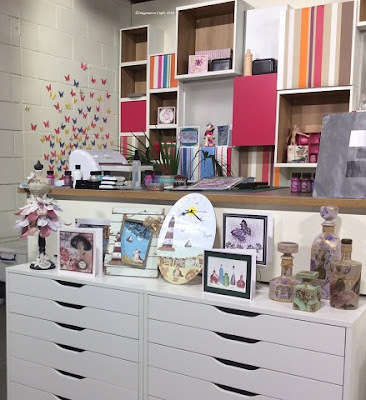 This week we begin the release of some of our BRAND NEW products for 2016 & we're thrilled to be launching some of those products on Hochanda, starting tomorrow night, Wednesday, February 17 at 8pm & continuing on Thursday, February 18 - programme times are 9am, 12pm, 4pm & 7pm GMT.